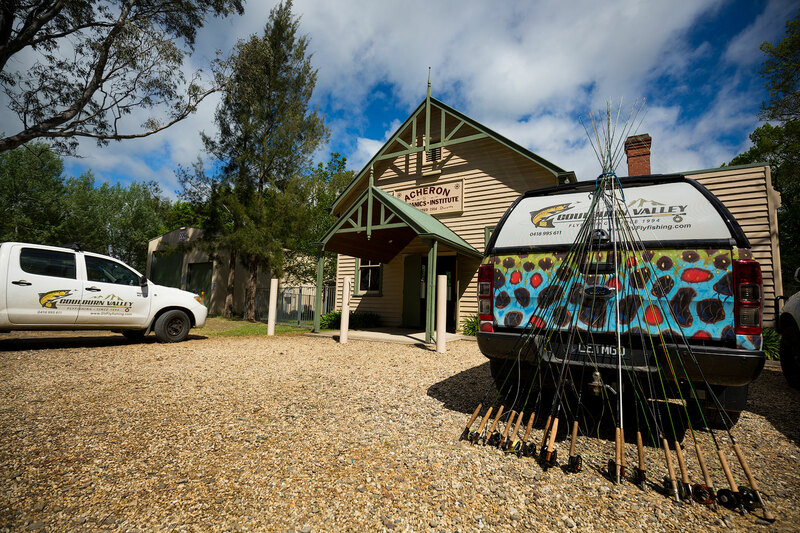 Fly fishing gift certificates Australia. No time limit. Same day email service. our vouchers have no time-limit and can be exchanged for goods and/or services. It doesn’t matter what the voucher was purchased for, the voucher value can be applied to any of our offerings. we provide the most extensive range of fly fishing services in the country, meaning that our vouchers are suitable for all fly fishers, from beginner to advanced. choice of an emailed version that can arrive within minutes of ordering, or a beautiful hard copy can be express posted that same day. 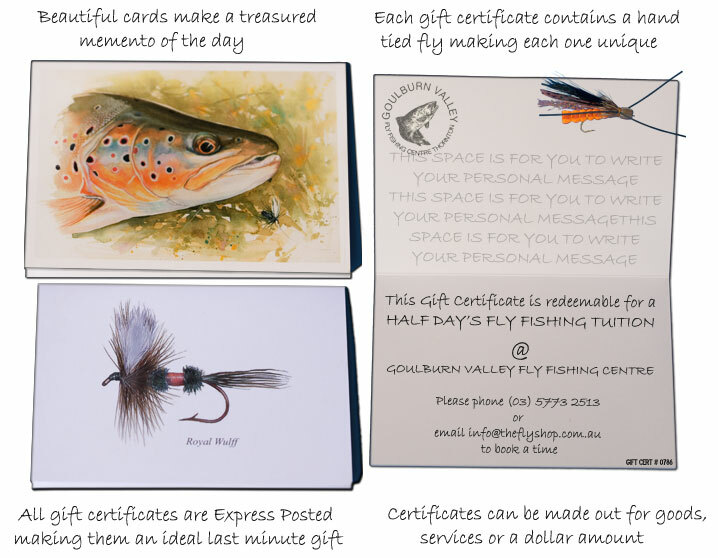 The card is custom-made with amazing artwork by Derek De Young and finished off with a hand-tied trout fly and stamped with our old rustic Goulburn Valley Fly Fishing Centre stamp circa 1994. 25 years in business means that we will still be here when the lucky recipient decides to use it. 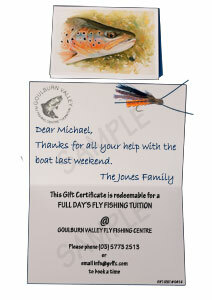 Our unique hard copy gift certificates are the perfect gift for fly fishers of all experience levels. Each card is itself, one of a kind. Starting with a high quality gift card featuring the amazing artwork by Derek De Young, we customise each one for the particular recipient to ensure that your gift is as special as it can be. All of our gift certificates are left with space for you to write a few special words to the recipient, and they also feature a hand-tied fly. Not only to they make a lovely gift, but they are also a really nice memento of the day. Our vouchers have no time limit, and can be used to purchase products, services and accommodation. We offer a wide-array of products and services not found anywhere else in Australia. Being full time guides/instructors located only minutes from the Goulburn River, we can offer everything from introductory lessons to drift boat trips, streamcraft tuition to full blown 7-21 day adventures to the best fly fishing on the planet in places like New Zealand’s South Island, as well as Montana, USA and Patagonia, Argentina. Don’t know exactly what you’re after? No problem. Simply order a gift voucher for a dollar amount and let the recipient choose. In any case, all of our gift certificates are redeemable for any of our products/services/trips. 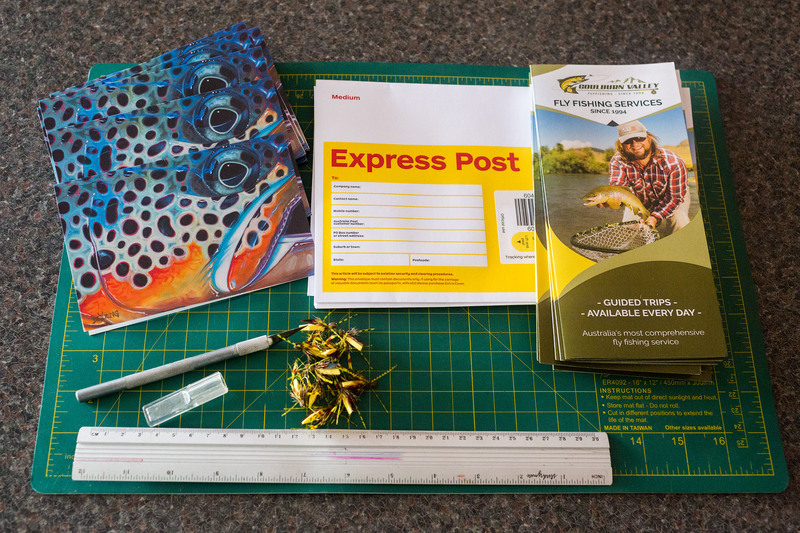 Our unique service based business ensures that a gift certificate from us is certain to please even the fussiest of fly fishers. Need a special gift at the last minute? No problem! All Gift Certificates are Express Posted ensuring that all orders received before 2.45pm will arrive the following day (in Victoria) and within 48 hours for interstate orders! LAST MINUTE – NEED A GIFT CERTIFICATE TODAY? Don’t worry! We can make up a high resolution JPG or PDF version to email you within 30 minutes if you order over the phone. This is our most popular option and means you can print a high-quality colour version of it immediately. It also means that you save the $12 charge incurred when a physical card is created and sent out via express post. If ordering a last-minute email voucher, please phone us on 03 5773 2513 to ensure that we get it to you ASAP. If you phone us and we are out on the river, we can immediately send a generic version from our phones to hold you over until we return to the office later that day. So what are you waiting for? Give us a call today on Free Call 03 5773 2513 to order one today.